The Ultimate Road to Hana Tour consists of a 5-hour land tour and a 35-minute helicopter tour of the majestic East Maui, Road to Hana and Haleakala Crater. You have the option to choose the early tour time 7:00 AM to 1 PM, which begins with a land tour on the famous Road to Hana and return from Hana Airport on your 35-minute helicopter tour. Wai’ananapanapa State Park 120 acres of a Must Stop-Scenery Area and to Swim at the Black Sand Beach where old Hawaii still exists. Hana is known as the breathtaking, tropical rainforest of the Pacific! Join us along the two-lane windy road to Hana with over 617 curves and 59 one lane bridges for a spectacular journey aboard our fleet of Mercedes Sprinters. There are many photo opportunities with countless cascading waterfalls. Join us as we explore the black sand beaches, waterfalls, and view the bamboo jungles along the Road to Hana! The Road to Hana is a must-do tour for Maui visitors. The two-lane route, also known as Hāna “Highway”, connects Kahului with the small town of Hana in east Maui. It offers some of the most stunning scenic views of all of Hawaii. Experience the beauty of East Maui on our Ultimate Road to Hana Tour, taking you on a 5-hour exploration by land along the famed Road to Hana and a 35-minute helicopter tour over Haleakala Crater! 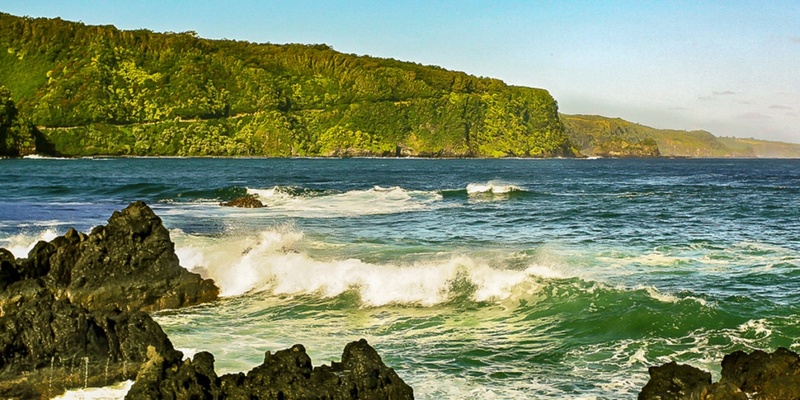 This eco-adventure allows you to learn about ancient Hawaiian legends and culture while exploring lush tropical rainforests, majestic waterfalls, black sand beaches, and bamboo jungles along the Hana Highway of East Maui. By air, marvel at the world’s largest dormant volcano of Haleakala Crater and the massive rainforest that sweeps the east side of Maui. The tour begins either at 7 AM or 11:15 AM, lasting about 5 hours and includes a delicious BBQ buffet lunch at Hana Ranch.